This baked lemon cheesecake recipe has been adapted from Eliza Acton’s cookbook, published in 1845. The recipe’s update is based on a modern classic – New York cheesecake. 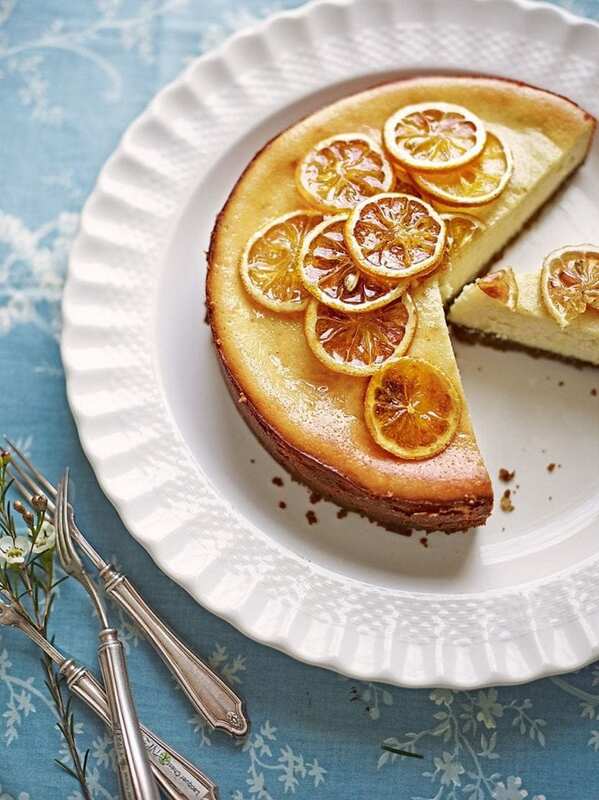 For the caramelised lemon slices, heat the oven to 140°C/120°C fan/ gas. Line a baking sheet with baking paper and sift over a good layer of icing sugar. Lay the lemon slices on top of the sugar, then sift more icing sugar on top of them. Sprinkle over a few drops of water, then bake for around 1 hour until the lemons are golden and caramelised. Carefully lift them off the baking paper with a palette knife and leave to cool on a wire rack until ready to use. If you’re keeping them overnight, store in between sheets of baking paper in an airtight container. For the base of the cheesecake, whizz the speculoos biscuits in a food processor, or put in a freezer bag and bash with a rolling pin to form fine crumbs. Whizz or stir in the melted butter in a mixing bowl along with a pinch of salt, then pack into the base of a 20cm loosebottomed cake tin in an even layer, smoothing it down using the back of a soup spoon. Chill until needed. Heat the oven to 180°C/160°C fan/ gas 4. For the filling, mix the room temperature cream cheese, caster sugar and soured cream together in a mixing bowl with a balloon whisk (or with an electric mixer) until smooth. Gently beat in the eggs, one at a time, then add the vanilla extract and lemon zest and juice. Fold in the flour with a balloon whisk until smooth. Spoon the mixture over the chilled biscuit base, then level the top. Bake for 50-60 minutes until the top is lightly golden and set at the edges but the middle still has a good wobble when the cheesecake is shaken gently. Remove from the oven and leave to cool completely before removing from the tin. To serve, top with the caramelised lemon slices and dust with a little more icing sugar, if you like. The cheesecake will benefit from a night in the fridge. You can eat it just cooled, but it will be harder to cut cleanly. Make it up to 2 days ahead, then take out of the fridge 1-2 hours before serving. Make the caramelised lemons the day before (see step 1). I love this recipe because it works and is the perfect dessert to a great dinner party.